Hello and welcome! My name is Shelli Nornes, and I am honored to be your wedding travel specialist. Each and every one of you is very important to me. I am committed to providing you the best service and experience possible. I take great care in creating the perfect travel experience for my brides and grooms, as well as their friends and family. Collin and Kara have already blocked rooms for you. You'll find room options and prices below. To take over one of the rooms we're holding, please click on the "Book Your Room" button below and make your deposit. If you need help pricing the rooms, please don't hesitate to call or email me. Please note that all rooms need to be booked and paid in full by January 19, 2018. Collin and Kara need to release extra rooms in time to avoid penalties. The earlier you book, the easier you make it on them. Be kind... book early! I am looking forward to assisting you with all your travel needs! I have a passion for travel, and tons of experience with destination weddings. The earlier we begin, the better chance you have of getting the room and dates you want. I look forward to hearing from you! Any room below labeled "Preferred Club" will receive the Preferred Club privileges listed here. 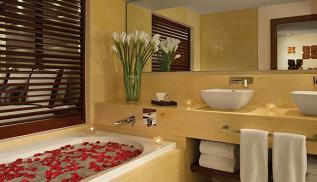 The room rates start with a 3 night package, then add each additional night you may want to stay. We are holding rooming for April 3-10.. You can request to arrive early or stay longer that this.... I'll just need to get the extra nights approved by the hotel. 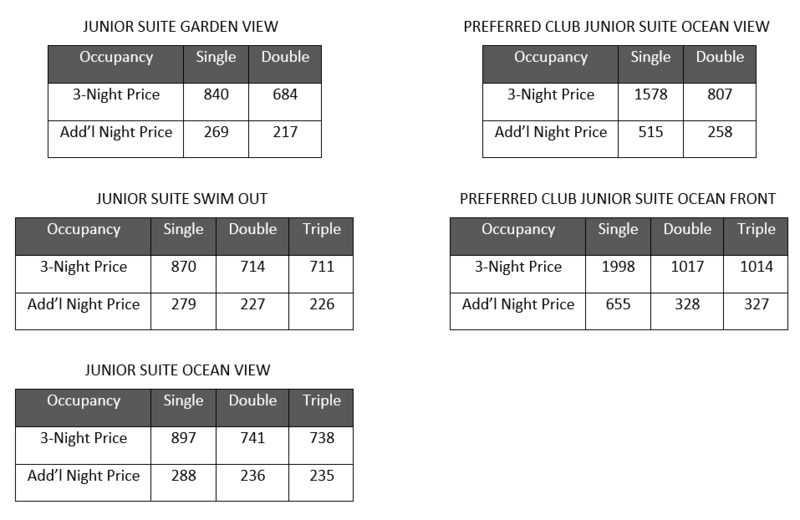 The prices below include the room, roundtrip airport shuttles from the Cancun airport, meals, drinks, and taxes. The rates are per person, and are based on how many adults are sharing the room. Single = 1 person. Double = 2 people. Triple = 3 people. The hotel does not allow more than 3 adults in a room. 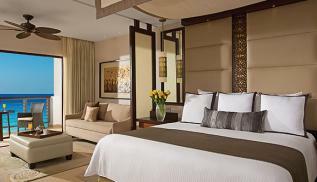 To price the room, start with the 3 night package, then add each additional night. For example, for the Junior Suite Garden View room for 2 people for 4 nights, you'd add $217 + $684 to get a total of $901 per person for the 4 night stay. The grand total on the room would be $1802. FINAL PAYMENTS are due by January 19, 2018. There is a $50 late payment penalty applied to reservations that are not paid in full by this date. If the reservation is not paid in full within 7 days of the final payment date, the reservation will automatically cancel and any payments will be forfeited. FINAL PAYMENTS are due by January 19, 2018. If you have any questions, please call me at 507-267-4857 or EMAIL ME. Thank you!